07:30: We depart Dublin and begin our journey northward through the beautiful countryside. During our journey to Northern Ireland, we will be sure to take a comfort break where you can enjoy some light refreshments before we continue our route. Our state-of-the-art Mercedes- Benz tour vehicle will seat no more than 16 passengers for maximum comfort.Once we cross the border into Northern Ireland, we will venture through the scenic glacier-carved landscape known as the Glens of Antrim. We will have the opportunity to view beautiful mountains, rollings hills, and magnificent coastal views of Rathlin Island and the Shore’s of Scotland.Giant’s CausewayOne of nature's most breathtaking sights, the causeway is made up of 40,000 hexagonal basalt columns that were created by volcanic activity 60 million years ago. 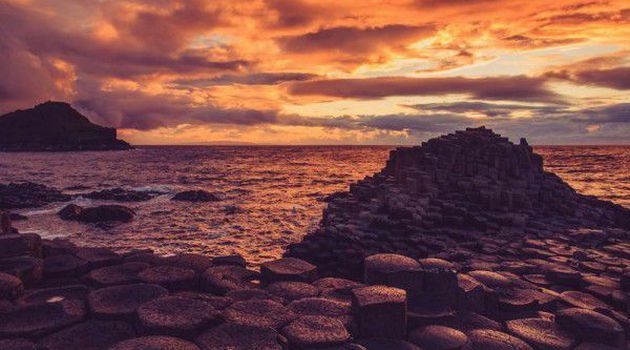 However, legend has it that the Giant’s Causeway was used by legendary Irishman, Finn McCool, during his journey to fight the Scottish giant, Benandonner, and steal the most beautiful girl in all of the highlands. After viewing this unique UNESCO World Heritage Site, we will have time to stop for lunch where you can savor some local cuisine. With two hours and thirty minutes dedicated to the Causeway, you will have plenty of time to eat and experience this natural wonder.BelfastWhile in Northern Ireland’s capital you will have two hours to enjoy one of these two options, costs included;A) The legendary ocean liner RMS Titanic was built here in Belfast’s docklands, which used to be the leading manufacturer of ships in the world. In order to commemorate the loss of the notorious cruise liner they have created the Titanic Experience. Opened on the 100th anniversary of the ship’s sinking, the exhibition brings to life the 40,000 workers who built the famed vessel and unveils unseen details of the Titanic’s tragic sinking on her maiden voyage in 1912. You will have the opportunity to experience original artifacts and virtual reality exhibits while exploring one of Belfast’s most famed attractions.B) Belfast’s neighbourhoods are painted with infamous political murals and the prominent peace walls that are remnants and reminders of the conflict known as the Troubles (1969-1998). You will have the option to take a Black Taxi Tour of these neighborhoods where you can discover the dark history that lies behind these painting. The Black Taxi Tour guides are leading experts on the Troubles and are the perfect tour for those wanting to learn more about Ireland’s history.Return to DublinWe depart Belfast and make our way back to Dublin where will arrive at approximately 19:30after an awe- inspiring day. Choose to drop- off either in downtown Dublin or at the same hotel you were collected from.